Notes: This truck did not come with a headliner from the factory. 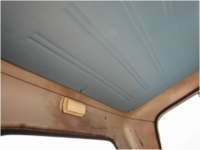 This headliner is made from heavy duty pressboard covered with vinyl and has dielectric heat sealed simulated stitch lines. Included are instructions, matching vinyl caps/screws and adhesive back Velcro. Drilling is required. Each board ships with predrilled holes which gives the installer the location for all 8 holes to be drilled. Stock Interiors is proud to offer the highest quality	Chevy Full Size Truck, Standard Cab Headliner Replacements available. Our Headliner boards are made to fit just like the original. This headliner board is made of pressed board and is the same shape as your original Chevy Full Size Truck, Standard Cab board, and will not warp or absorb moisture resulting in a headliner that will look as good as your original! Each headliner is covered with Madrid Vinyl material in the color of your choice.